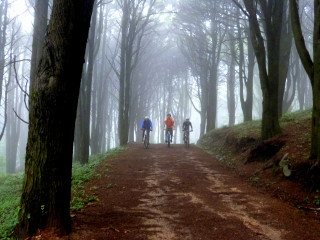 Our public tour is mostly off-road and hilly, and the difficulty ranges between easy and medium. The first customers to book set the difficulty level by letting us know their preference. The tour begins at 9:00 a.m. with a hotel pickup. You are returned to your hotel at around 6:30 p.m. latest. Maximum group size is 8 people. However, a booking can be made for up to 150 people (with multiple guides). For bookings larger than 70 people, please contact us. 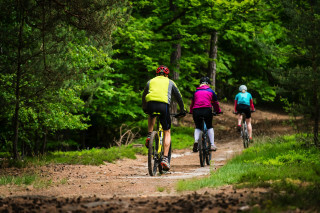 Please consider your cycling skills and fitness level before joining. - Child seats for children 1-3 years old and under 22 kg (48.5 lbs). - Tag-along, 20" wheel bikes for children 4-6 years old (depending on cycling ability and size). - 24” wheel bikes for children from 7 to 9 years old (depending on cycling ability and size). Your booking will become valid after we receive your payment and send you an email confirmation. 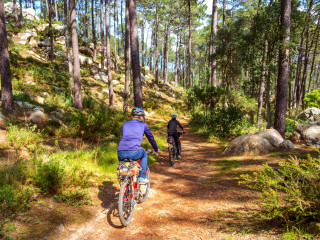 The culture of Sintra, the mountains of the Sintra-Cascais National Park, a coastline as stunning as the thick forests and hilltops near it...this mountain bike tour takes you through paths that cover it all. After your hotel pickup via an air-conditioned van at 9:00 a.m., we begin our drive to the Natural Park. Your guide tells you about the country's evolution, the flora and fauna you will soon discover, and other interesting facts that spike your curiosity about what's ahead. We first reach the unique village of Sintra, which has been fascinating visitors for years with its historic buildings and fascinating scenery. 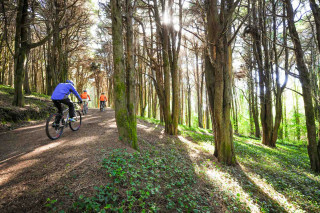 You are free to explore before the biking begins. At around 10:30 a.m., you're treated to a special local pastry at one of the best bakeries in all of Sintra. 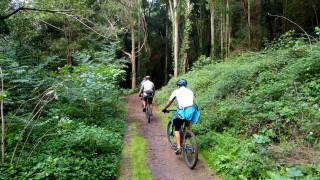 A short drive brings us to Peninha, located high on the Sintra mountain. Amongst a panorama of views and nothing but sounds of nature, we adjust our bikes and helmets, get a quick safety briefing, and receive a bottle of water. 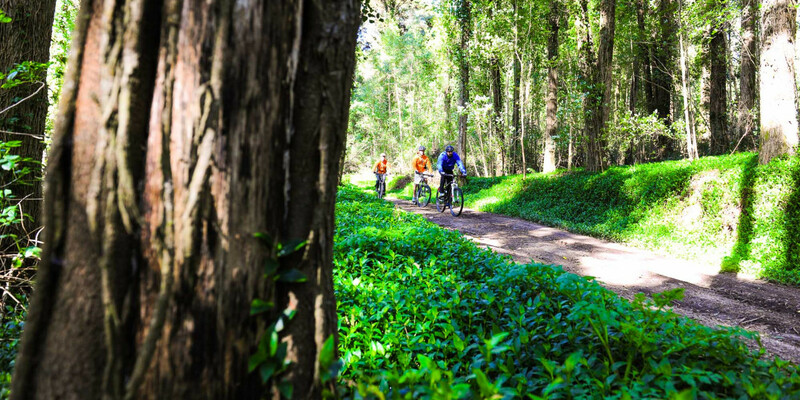 We mount our bikes at around 11:30 a.m. and begin our journey through the incredible landscape. 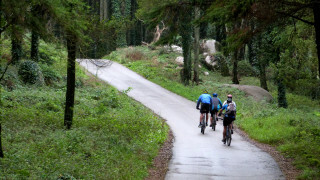 The tour is ideal for discovering Portugal's natural beauty in any season. The spring is a rainbow of colors, while bright yellow shrubs cover the hills during colder months. Wildlife is always present, with rabbits hopping by and hawks soaring through the sky. There is so much to learn about the area, too; luckily, you're with a local guide who's got all the answers. 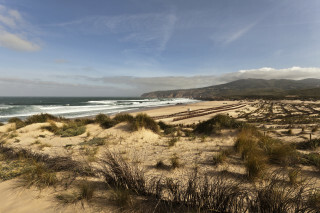 After three hours of off-road biking down thrilling forest paths, we reach Guincho beach and can grab some lunch at the local beach bar. Afterwards, there's time to go for a swim, stroll, or relax however you like. 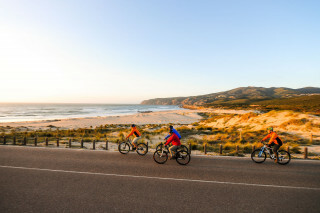 Or - depending on what you and your group prefer - we may ride to Cascais, a delightful fishing town with a beautiful coastline. Whatever you choose to do, your guide will make sure to treat you to a special wine tasting. Returning to Lisbon is another adventure as we drive down the Marginal, a coastal road running along the side of the river Tejo. 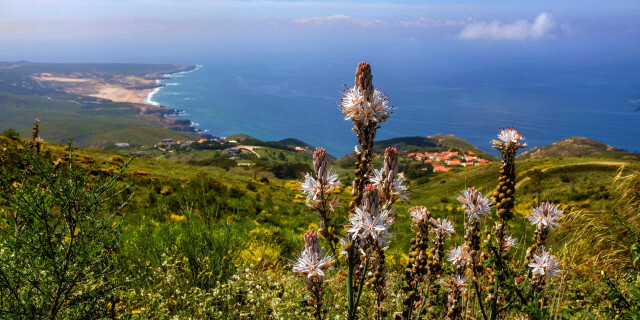 Moving through the most charming villages and towns around - Estoril, Oeiras, and Paco d'Arcos - we can stop if you see an amazing photo opportunity. And you'll definitely see a few. Back at your hotel in Lisbon at 6:30 p.m. feels like you haven't been there in days. 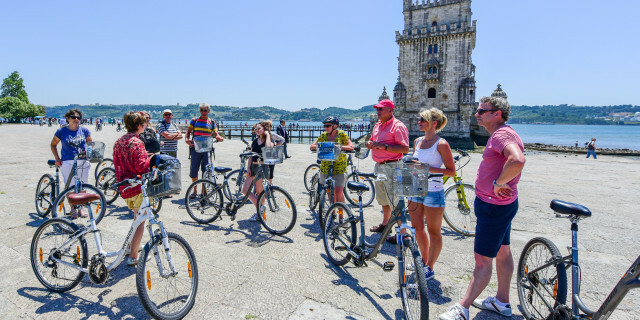 This day tour ensures you see more of Portugal than you ever could on your own, making it an irreplaceable experience on your Lisbon exploration.